I made them for one of my closest friends’ birthday. She loves bunnies (who doesn’t?) and she has the tiniest feet, so I was able to knit the smallest size. 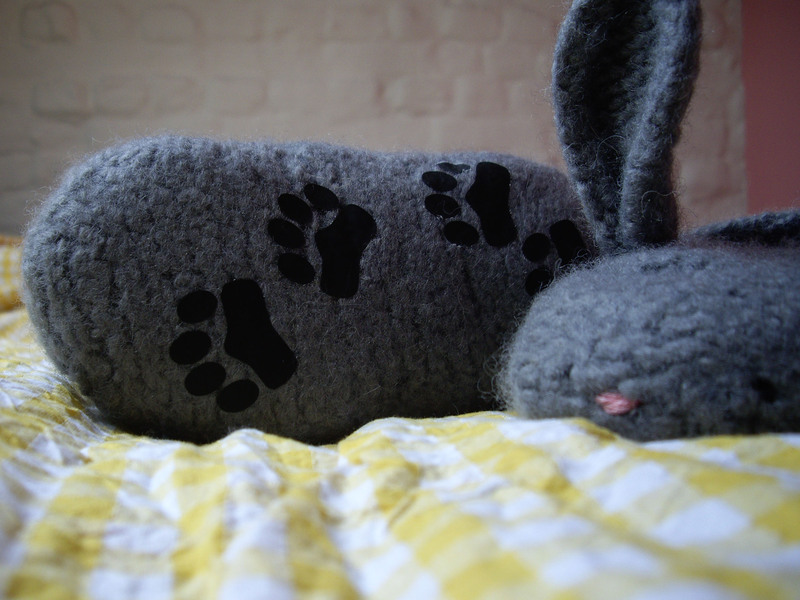 The pattern is hopslalots by Tiny Owl Knits. It was really easy to knit since it’s knit flat, only using moss and stockinette stitch with a few decreases and increases. I think the knitting part took me about four hours total. The joining part is also as easy as it gets with a few whipstitches that you can sew “like a 5-year-old might” (according to the instructions!) since everything will disappear with the felting. I think it was embroidering the faces that gave me the hardest time, especially to stop the stitches without creating any uncomfortable bulk inside the slippers, though come to think of it, this would have been much easier if I had simply taken the time to embroider one or two threads at a time instead of taking about sixteen threads at the same time! But look how cute! I will most certainly knit myself a pair in the near future. I used Wash+Filz-it! yarn by Schachenmayr with 9mm needles (I’m a tight knitter) and the size was spot on. 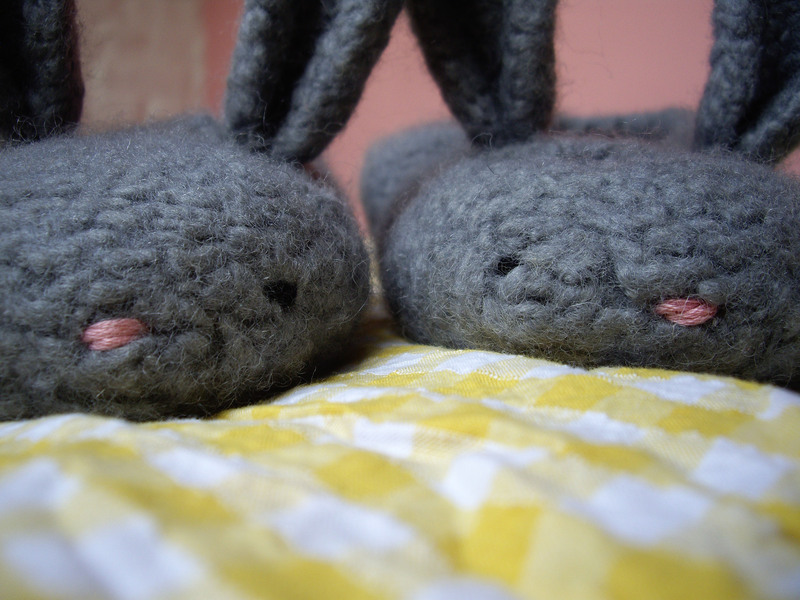 I machine felted the slippers, throwing them in the washing machine with my towels at 60°C, and boy was I anxious to see the result! When they came out of the wash, I was really afraid they would be too small (they looked so tiny! ), but they were actually just the right size for my friend, phew! I didn’t want the slippers to cause any danger, so I added those cute Regia anti-slide stoppers to the soles. They were really easy to stick to the soles (with an iron), and they also look so cute! 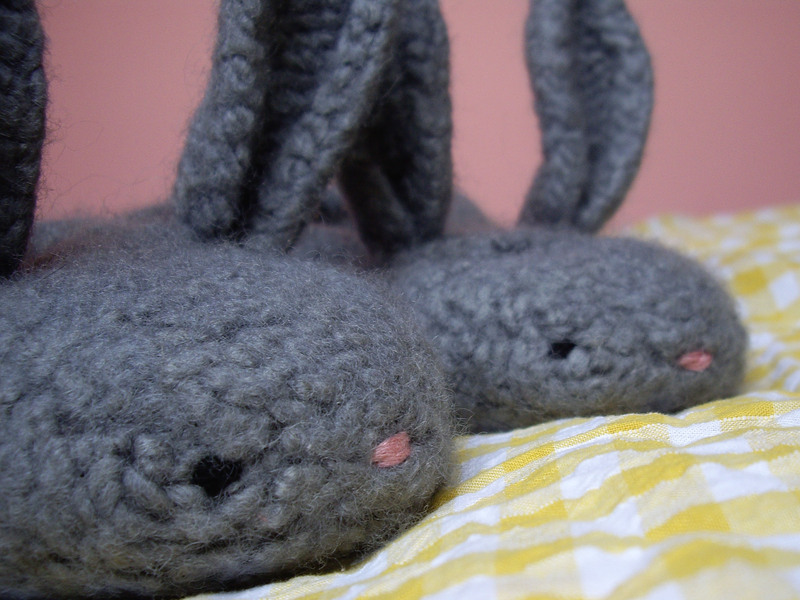 Knitting those adorable slippers was really the break I needed from my current knitting project. I am usually very strict about working one project at a time, but my last project has been dragging on forever (I don’t know why, it’s not that difficult or anything), so I broke my self-imposed rules, and I think it was for the best. I’m very happy with the result (as is my friend) and I can’t wait to knit my own pair! And completing a successful knitting project is just the motivation I needed to get back to the project I’ve been working at on and off for so long. J’adore! je vais les épingler sur mon pinterest pour me motiver à les faire un jour. I LOVE those!!! I like Tiny Owl Knits, but haven’t seen this pattern before.. I so want to make them now! Make them, they are SO easy and really fast to knit for such a cute result! I’m in love witth Tiny !!!! 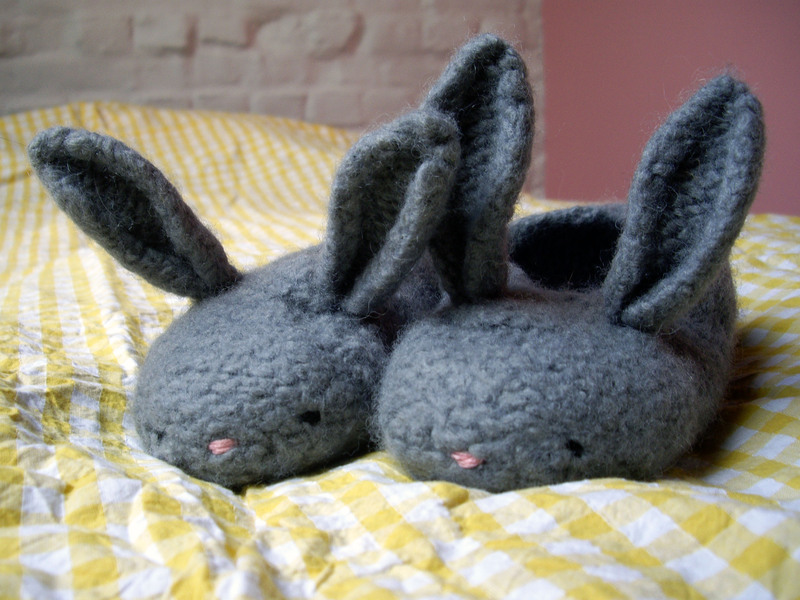 et là les petits lapins sont trop merveilleux, j’ai un patron en attente de la woodland hoodlet mais j’avoue que tricoter en anglais en ce moment me requiert trop d’énergie et devine je viens de gagner dans sa semaine Giveaway le dragon watcher’s !!!!!! Elle fait vraiment de jolis patrons, quelle chance d’avoir gagné le Giveaway dis donc! Je garde un œil sur son livre qui a l’air bien sympa!